This is the Authentic Bacteria House filter media from Japan. “Bacteria House filter media may be the best filter media on the planet for use in koi ponds and fish retail systems! It is a remarkable ceramic product that significantly impacts water quality and drastically improves fish health.” Myron Kloubec, Kloubec Koi Farm. Pond owners and fish retailers will notice improved water quality and increased fish vigor shortly after the implementation of the world famous Bacteria House filter media by Momotaro Koi Farm in Japan. Bacteria House filter media is versatile! Add to pond wherever water flows. Can be submerged or combined with other filter media. Also great for use in shower towers. Bacteria House ceramic filter media is heat treated at 1300° C for 60+ hours. This method of extreme heat conditioning causes the ceramic media to break its internal bonds; in doing so, creates an exceptionally porous structure with increased surface area for very large bacteria populations to colonize within the expanded spaces. In addition, with the massive amount of voids or holes, mechanical filtration is also achieved. Large organic solids and decaying matter is degraded very quickly all without the blockage that generally occurs with other filter media products. One of the key elements of the Bacteria House filter media is that it reacts in a seemingly electrostatic manner with any floating organic material in the water column causing an increase in adhesion rate, thus creating clean clear water quickly and effectively. The Bacteria House filter media emits FAR infrared rays that allow higher levels of oxygen to dissolve in the pond water. FAR infrared rays such as these produced by the Bacteria House filter media and those discovered in natural springs have been shown to possess significant health benefits. Another benefit of the media is its ability to effectively de-gas koi pond water which lightens the load on the bio-mass and making the system less KH consuming than conventional filtration. Another significant benefit of the Momotaro Bacteria House filter media is its innate ability to bounce back following a power-outage or a medication treatment. Live nitrifying bacteria grow and reproduce very quickly on this amazing filter media. 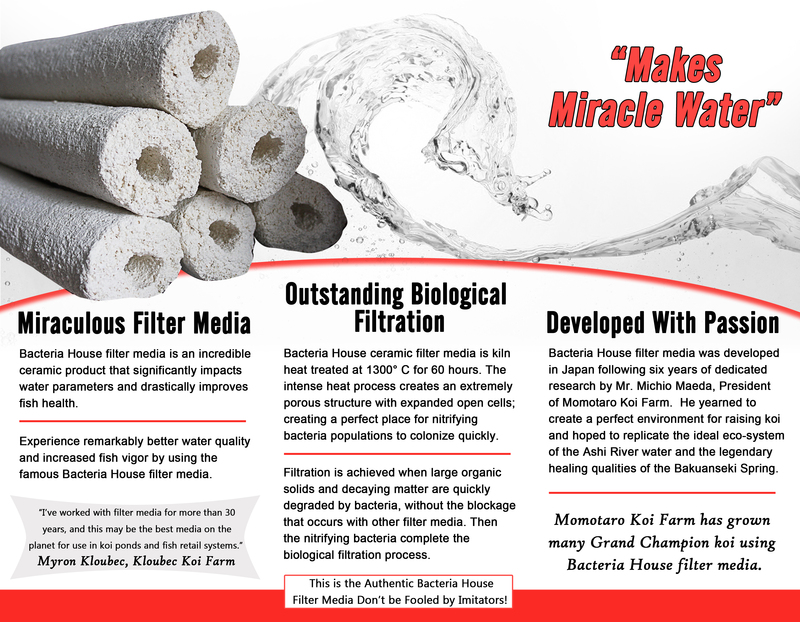 Bacteria House filter media is a ceramic product that was developed in Japan following over six years of research by Mr. Michio Maeda, president of the Momotaro Koi Farm. Mr. Maeda yearned to create an ideal environment for which to raise his koi. The Bacteria House filter media product was developed to replicate the ideal eco-system of the Ashi River and the infamous healing qualities of the Bakuanseki Spring, both located in Japan and familiar to the creator, Mr Maeda. I am so glad I purchased this product (twice now). My Koi garden pond, with lilies and cat tail plants, has never been in this condition. The fish are happy, so I'm happy. They're so much more lively now and the plants are also thriving. Thank you, Kloubec Koi Farm! This is much more than surface area. I did a lot of research before buying. Bacteria House media makes particles fall out of the water and stick to the media because of its electrostatic characteristics. That makes the water super clear. It also emits far infrared rays that break up water clusters and allow more oxygen in the water. Far infrared technology is used for humans for many health benefits. I researched that too. This is my second 10 lb purchase. I expanded the filter system so water has to pass through bacteria house media before entering the pond. My 6,000 gallon pond is crystal clear down to four feet, the fish are ravenous and active. I plan to buy more in the future until the container is full even if that is overkill--nothing but the best for my fishies! There are knock-offs but I don't know if they're as good so I'm sticking with the real stuff. Most of my koi came from Kloubec too because they're awesome and healthy and from a closed system. I've been struggling with algae in my 1500 gallon pond for 2 summers with zero progress. Myron and Ellen sold me a 10 pound box of the Momotaro cylinders at a koi show. This was about 5 weeks ago. I put them under my waterfall. This morning I could see the bottom of my pond for the first time in 2 years. Wonderful. So far I'm liking the results I'm seeing with this product. My water seems clearer than before. Our pond is about 3500 gallons, and it is open to a lot of sunlight, causing lots of algae and cloudiness in the water as the summer progresses. I've had the Bacteria House Filters in the water about 3 weeks now and the results are absolutely amazing. My water is clear and our beloved koi are active, colorful and healthy. The ceramic pieces must be placed where there is running or moving water. That's it. Don't be afraid to use all of the pieces recommended for very best results. Pond appears cleaner. It did not take long for algae to start forming in the media. Very pleased and satisfied. Back in August of 2013, I purchased 20 lbs. of the Shower House Media 2013 and have seen a significant difference in both water quality and fish health. Even though Myron mentioned that it will take about a month or more for the media to season, I noticed that my water seem to be more “polished” within a week after adding the media. However, what really impressed me the most was with its healing properties. I have a Yamabuki Ogon that had a nasty tear in its top dorsal fin for over two years. I was pleasantly surprised to notice that the dorsal fin began to regrow new tissue within a couple of months. Now, 6 months later you can barely tell that there was a tear in the fin. Now that is truly amazing! Needless to say, I just purchased another 10 lb. in February and plan to purchase more down the road. I would highly recommend this media to anyone who has invested in koi and want to ensure that they remain healthy. This is a much better and cheaper alternative than pouring chemicals into your pond or having to inject sick fish. We have had several ponds of the last 13 years. Our current pond is 8,000 gallons and home to 20 Koi, several of which are over 27". We are constantly researching and upgrading the filter system and thought our system was very good. One of our fish won Grand Champion at the MI 2013 Koi show. We were talking to Myron and Ellen at the MI Koi show and they told us about the Bacteria House Filter media. Knowing the research and personal commitment to anything they sell, we decided to give it a try. We purchased 40 lbs and installed it in our protien skimmer in September. We couldn't believe the difference in just 1 week. Our water is now polished to perfection! Our fish look better and are healthier. Without any hesitation we now tell everyone with a Koi pond about the Bacteria House Filter media. The media more than meets our expectations. 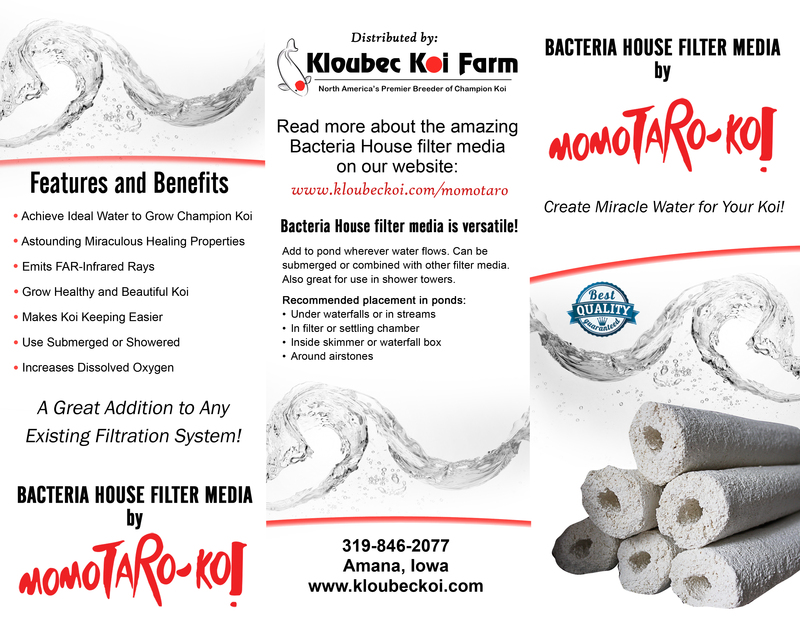 Click the button below to add the Momotaro Filter Media - Bacteria House Media to your wish list.